Every person’s birth is documented through a sample birth certificate. It is an official and legal document that should be made after a baby is born. 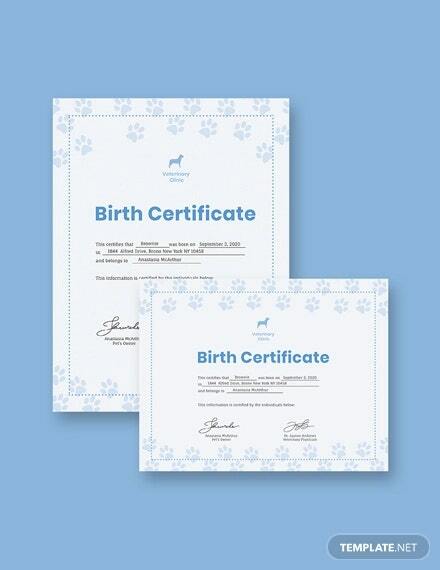 In a birth certificate, it contains his name, date of birth, an order of birth (if he has a twin, or in the case of multiple births), his place of birth, and the name of the parents. A birth certificate is important to the child would have a proof of his identity and existence in the society. The child should be registered in the local government office of his place of birth. You may also see Certificate Templates. A child’s existence is useless without a birth certificate. Parents should register their child days after birth. Every detail of the certificate needs to be filled to build the child’s identity. If you want to go artsier with your birth certificate, check out our collection of templates below for some great ideas. 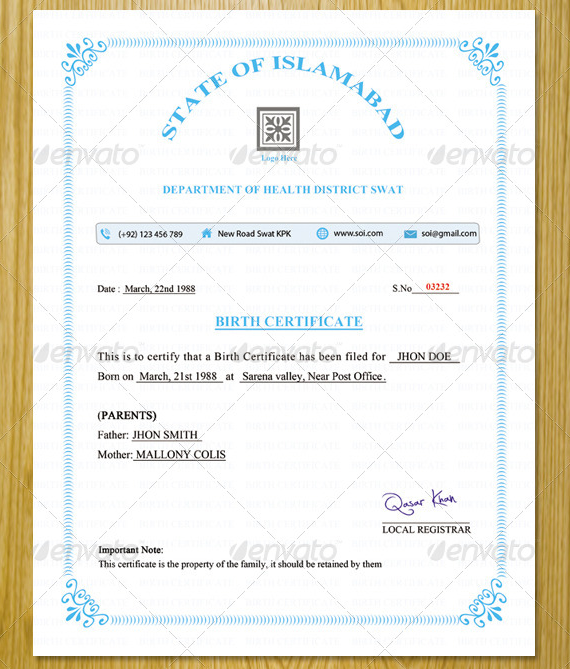 There are a lot of available birth certificate templates for your child online. The first thing you have to do is search for these templates and see what suits your style. Always look for a template that looks pleasing to the eyes and armed with an attractive design. However, you can also go for a simple design if you want. Buy the template if it suits your budget so you can download it online. The editing part comes after purchasing the template. Make sure the template is compatible with your photo editing applications so it would run properly. Now you can experiment with the color and change the text. Leave some blank spaces for the information about the child, such as his name, place, date and time of birth, the baby’s height and weight, and the names of the parents. Template editing needs a lot of concentration. You have to spend time editing and re-editing the template to get the perfect mix that you want. Always remember to save your work every now and then. This saves you from the hassle of retrieving your file in case of power outage. Before printing your template, do a final edit and add some finishing touches. There may be some minor errors that you may not have noticed while doing the first draft of the template’s design. You may be able to see these errors when you add the finishing touches. Take some time to edit everything until you’re satisfied with the final design. Save your work and print the template. 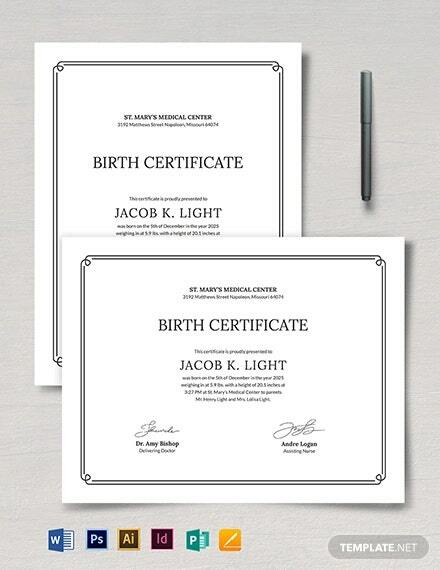 You may also see sample birthday certificates. 1. A proof of identity. Birth certificates are proof that you exist in the community you live in. All people have it upon birth as they are registered by their parents. 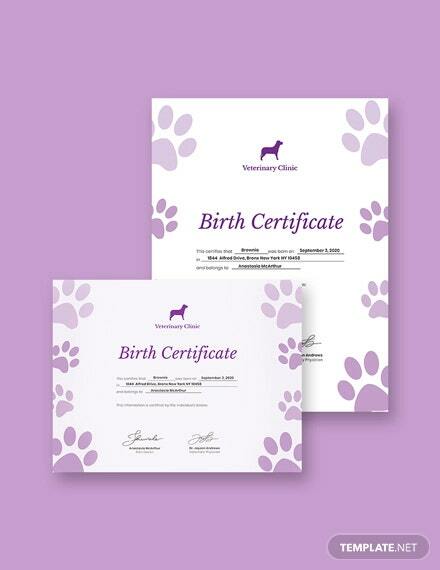 Birth certificates are asked for aside from your name whenever you do any formal transaction. It is proof that what you say as your name is the same as what is written in the certificate. 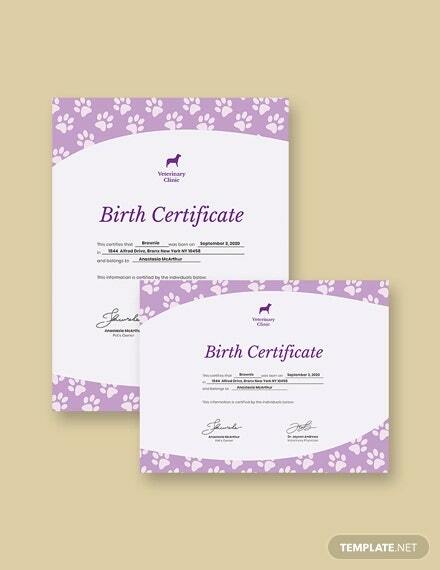 You may also see pet birth certificate templates. 2. A requirement for other government documents. Birth certificates are needed when you get other government documents such as your tax return, diploma in schools, job hunting and a whole lot of other legal stuff. Banks would also require birth certificates when you need a transaction or you want to open a savings account. They would ask for it to prove that you are a registered citizen wherever you are born. These documents are essential when you begin working, so it’s a must that you have a birth certificate. Education is an important part of a person’s life. It is where he can access many opportunities for a better life after he finishes his studies. Schools require birth certificate upon the enrollment of the child. This is for the purpose of his records. His name should match with his name in the certificate. His school records are also required when he applies for a job, along with his birth certificate. You may also see a free official birth certificate. Some families are well-off and give their children the inheritance they intended to leave behind when they die. To get your part of the inheritance, a birth certificate should be presented to the lawyers. This proves your family ties and relations, and for you to get what is right for you. You may also see certificate template samples. The government documents a child’s existence through birth certificates. If a child or a person gets entangled in a crime or experiences abuse, the birth certificate is one of the things that can protect him from any harm. The law is incapable of protecting people without any proper proof of identity. The law also grants legal rights to those who have birth certificates. You may also see sample certificate templates. 6. Gives access to health care. Getting access to health care requires the birth certificate. Hospitals and healthcare centers can’t give you the right treatment and medication when you don’t have a proof of your identity. They need to know who gets what medicine so they can track it in their record. Health care is an important factor in a person’s life. A person can’t be healthy at all times. Proper health care prolongs life. When you need to travel out of the country, you need a birth certificate for you to get a passport. A passport serves as an identity when you go to another country. Otherwise, you would be treated as an alien and be sent back home. It goes the same for settling abroad. The new country you will be living in will require you to have a birth certificate so you can get the same amount of benefits and access to luxuries as the homegrown citizens. 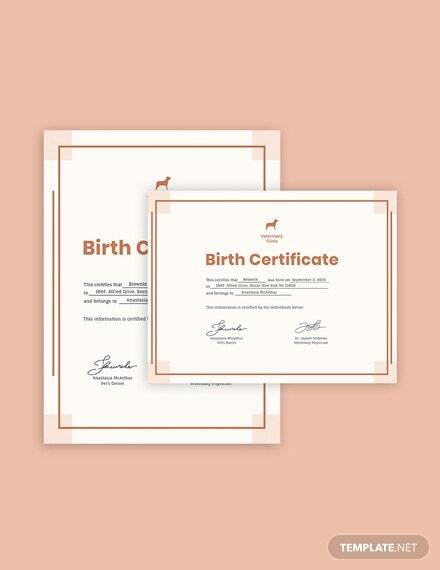 You may also see baby certificate templates. Getting a birth certificate is a big step in accessing legal rights and opportunities a person should be getting in his lifetime. This is the sole importance of having your child registered in your local community upon birth. There is no better time for registering the child since it is his gateway to many things once he starts growing up. You may also see certificate templates.